If you're a scrapbooker or journaller, it might raise an interest. There's been such a retro trend that one of the scrapbook companies (WRMK) have produced 'new' typewriters, and they're expensive. I don't remember when, but I do remember always wanting a typewriter, it goes with my obsession for office stationery and my entirely unfulfilled ambition to be a famous novelist or exciting, scoop-a-day journalist. Anyway, I found that the resurgence of typewriters meant that I could buy a new ribbon at a price that made me cough (but didn't stop me, and indeed, ended up costing me a deal more 'free delivery' - you know). So I took it with me to the Coven's weekend away. Put it with all the other shared tools and completely forgot to use it. Did some hand written journaling, didn't even think about typing it. I think I need to have it open and on the desk in front of me to remind me that I have it. Trouble with that, as you can see, is the size....it consumes exactly the size of space that I'm most able to clear on the old desk. Better talk to Mr Dunnit about another shelf. And to be honest, it is difficult to use - the necessary weight for key striking is quite exhausting. And making a mistake is just so time consuming! I was away at the weekend, a scrapbook retreat with the Coven. When I got home, I half unpacked. And as I had left my desk in a semi clear state, it didn't look too bad at tea time yesterday when I took this photo. Obviously I'm not going to show you (all) the layouts I made - I need those as decoy photos for later posts when I'm inevitably whining about not getting anything done. So instead, here's a desk and a building site. The beginnings of goodish weather are starting to bring changes that don't involve snowdrops! The empty cereal packet will be transformed - covered - and re-purposed as a box in which to put post. The system in our house is that you open post, and then put it in a pile to deal with at some point. Well, I got sick of the pile, so now we have a converted cereal box on the wall in the kitchen. And I promised a friend I'd provide one for her when I had the right cereal box. You wish you hadn't asked now, don't you! In the best tradition of revelation, there's a curly-wurly on top of two inkpads at right, with a bite taken from it. I'm nothing if not fussy about snack food hygiene. And there's my thumping good Bluetooth speaker. More on that soon, I expect; I like a brag. So please show and tell a little about your workspace. Put WOYWW in your post title and link it here. Its fun, its free and its very friendly. Hello Deskers! I have a small surprise for you. There's space on my desk. Before you break out the trumpets and hang out the flags though, be looking at the picture. Space. Not tidied so much; achieved by finishing stuff, moving stuff around and needing to make a card. I used the Hero Arts stamp you see on the desk. The dies in front of the easel are from another card I made at the weekend, and the Perspex box a left contains my collection of gems and shinies, used on yet another card. I may be on to something here....The little canvas on the easel is awaiting repair still. I had hoped to find another copy of the picture but I can't, so I'm walking around it again. My lovely useful office lamp looks perfectly placed and quite benign doesn't it. Well, it's not. Last night the bulb blew. And I mean blew...the glass balloon part blew off and left the filament and screwy in bit lodged in the screwy in bit bit, humming! I don't know why, but despite jumping about three feet into the air, I managed not to scream, or (impressively) swear, but I'm thinking about insuring my hands! Please to join in and show and tell about your own desk/work station. It's fun, it's free and it's friendly. Can't do better than that! I've been trying incredibly hard to curtail the purchasing of stash until I've achieved a visible dent in the stash I've already got. By this, I mean that I'm trying to use scrapbook papers and embellishments. I'm afraid I cant 'use up' stamps in the same manner, and they will continue to multiply on my shelves...although in far fewer numbers so far this year - I've been quite/almost strong. On that basis, I challenged myself for my first workshop to use stuff that I had, rather than cracking open a bunch of new stuff. You know, proving that I didn't buy something for a single idea, making the most of what I've got...yep, being creative and therefore flexible. It worked, in the main. The pom pom was new - it came from Baker Ross, but you can forgive that surely - technically you see, I didn't buy it! I blow hot and cold about this brick wall embossing folder - for ages I wondered why I'd bought it, and then I have a fit of ideas for it and think it's indispensable. When I use it the right way around of course. I'm pretty sure the 'grouting' effect that using it the wrong way around gives a card is really very useful, but I have to admit to it being a swear inducer. I have more work to do when it comes to my flexibility in getting the ideas out of my head and onto the card. But I'm claiming this as a double success - old(ish) stash and a card suitable for a man. Modest of me, I know, but I call that a result! Truth be told, there's work on my workdesk. Not very exciting, but certainly inspiring. 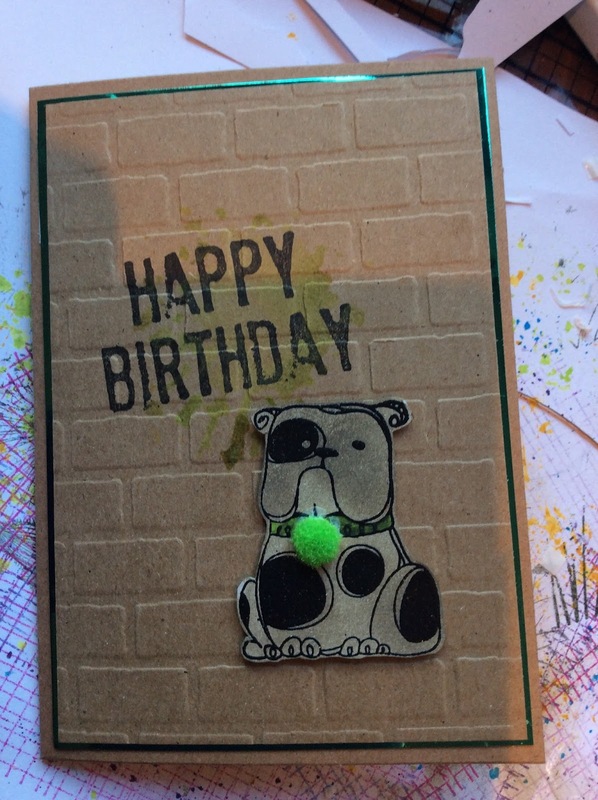 Or motivational - as soon as I've done it, it doesn't need to be on the desk and I can get back to card making. Or sorting out some kits for a scrapbooking session. It's all to do! Last year's accounts book features because the VAT return for our last quarter awaits, and it includes November and December. More interestingly, a Bluetooth speaker awaits my attention. See, we went to visit my lovely mate Jan and her fabulous Gordon at the weekend. Among all the non-stop talking was a segment where I may have moaned about the volume on my iPad. I trail it around the house with me, listening to talking books, and in the kitchen, I struggle to hear it if the kettle's on or the taps are running. Gordon just calmly said - 'oh, you need a Bluetooth speaker' and a light bulb went on in my head! He'll never know what a brilliant and simple answer this will be. Well, he will, of course, for I shall credit him with a modicum of brilliance if I can get the speaker to go. I can't quite get over the simplicity of it all - I mean, why on earth hadn't I thought of it? Strictly rhetorical question, friends! So there we are gentle Desker, the shape of my Wednesday desk work is before you. It will improve. I expect a lot of your desks feature Valentine cards - I shall look forward to the inspiration! Share and tell, there's a good person. I finally got myself the TH Crazy Birds. No dies, no extras, just the birds; and have spent a couple hours playing. All the black letters are destined for the bin, they were too big in relation to the bird. The TH alphabet die you see is discarded, destined to be placed back in the die store. It wasn't too big, but ohemgee, too fiddly for the phrase I wanted to use. Dirty water still there, but more safely placed. And it might be dirty, but I've used it again. Slattern. Ahem. See the cards I made are on their spines slotted between the clear drawers full of foam pads, stickies etc and the basket that's meant to hold stamps awaiting cleaning. Epic fail on the sorting front then. Oh well. And those two little words just might be the whole reason that I'm not progressing....oh well. Kinda means..it doesn't matter/no bother/it's OK. I'm pretty sure it's because I'm a middle child. Or something. Anyway, show me your 400th desk will ya? Put WOYWW in your post title so we can find it easily and then link that post here. Have a lovely 400th!